I remember when I first began oil painting that I was a little overwhelmed with the options. What are the best brushes to start with? 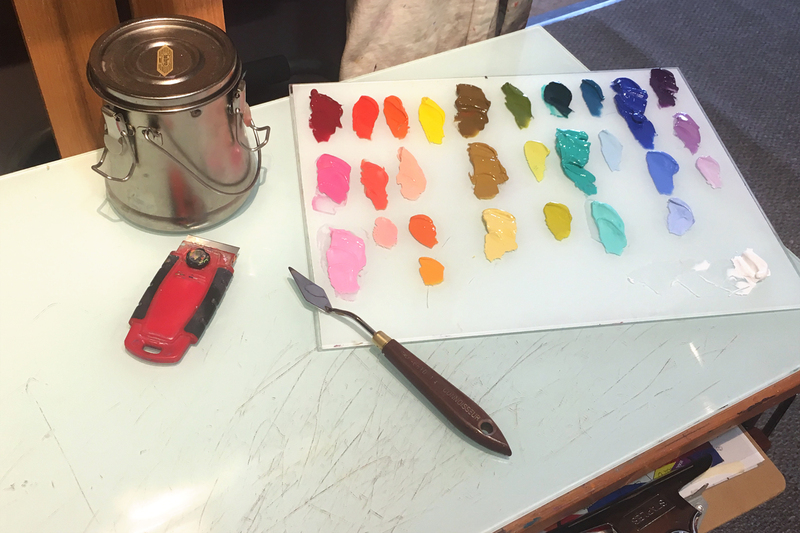 What is the difference between a palette knife and a paint knife – and do I need them both? Should I use canvas or panels? What are the different mediums, and what do they do? How do I pick out paint colors? What is fat over lean, alla prima, indirect vs direct painting, or impasto? What order do I even start in? And now that I’ve started, how do I finish? Oil painting can seem complex, but if you get started properly it can be one of the most versatile and forgiving mediums! The goal of this workshop is to cut through the jargon and fancy tools to get you right to the most important part – to get you painting with confidence! Because oil painting has a long and rich history, it’s picked up an armful of theories, approaches, and specialized jargon along the way. We’ll focus on the absolute fundamentals, getting the brush in your hand as soon as possible. We learn by doing, and oils are a fun and forgiving teacher! We will go over supplies, starting with brushes, knives, and painting surfaces. We’ll learn the simplest combination of materials to start with, and also discover how to build your studio tools based on your needs and preferences. We’ll learn about ways to prepare and display various painting surfaces, from the very traditional to a few more contemporary options. Most importantly, we will learn how to apply paint effectively, how best to handle the brush and knives, and how to fix our mistakes as we go. We’ll learn a simple and straightforward series of steps in painting, from composition tips and tricks to self-critique as we near finish. Finally, we will discuss the various mediums, varnishes, and other tools available for oil painting. While none of these are necessary in the beginning, we can discover which ones to ignore or adopt as we progress in our painting practices. Each day will be a combination of demonstration, in-class painting, and group review. Along the way we will cover basics such as drawing for painting, palette organization, and paint storage and cleanup tips. As we work, I will challenge students at their skill level. If you have never held a brush before, this is an excellent place to begin! If you are an experienced painter and would like a refresher, this will be an excellent place to smooth out old habits and hone new skills! The workshop will be held in a ballroom at the Holiday Inn Express and Suites in north Bozeman (near Costco). The hotel is right off of Interstate 90, and only 8 miles from the Yellowstone International Airport. Lunch is not provided, but there are several places to eat within walking distance and many, many more within a short drive. After signing up you will receive more information on nearby eateries, and I would be glad to answer any questions or offer suggestions if you are unfamiliar with the area! Workshop tuition can be paid all at once, or half now and half by July 28th. You can register online by clicking the button below, with the option of paying either by credit card or check. If you have taken a workshop with myself or through Cobalt Moose Art Studios with Terry Hall and I before, please contact me for an Alumni Discount! I have been teaching painting workshops for over nine years, and am thrilled to share everything I’ve learned – including my own mistakes over the years – with my students. My method is to always start students with the broad fundamentals so that they leave feeling empowered to continue on their own and have a base to continue to build skills on. I believe in fostering each student’s individual style and inclinations, and helping them to find the best working method according to their learning style and personality. Ever since I began painting in oils twelve years ago I have made a great study of many techniques, schools of thought, and historical movements in oil painting. One thing I find is that all painting comes down to a handful of fundamentals that don’t change much from movement to movement, no matter how different the end result can be. I am always looking for new information and new ways to share what I’m discovering, and I can’t wait to share it with you!